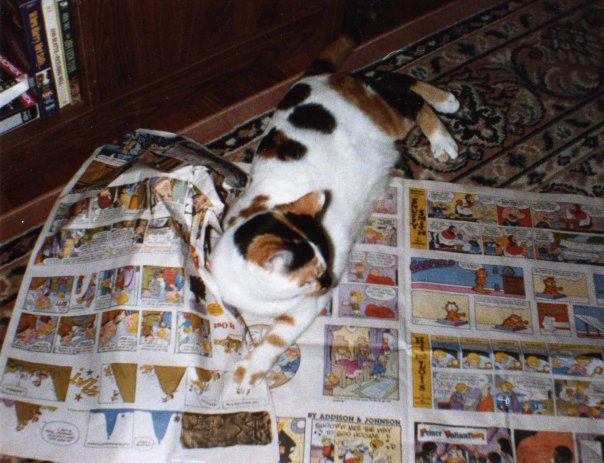 There is a week left to submit a picture of your cat reading. Entries may include photos or drawings/pictures of your pet or another. Don’t forget that our next contest will be a photo/entry of any pet, especially considering the dog days of August. Saturday August 13, the Friends’ Bookstore in the Rochester Public Library will host a paperback fiction sale in the library foyer from 10 AM to 1 PM. For each three books you purchase, you will receive one free (of equal or lesser value). 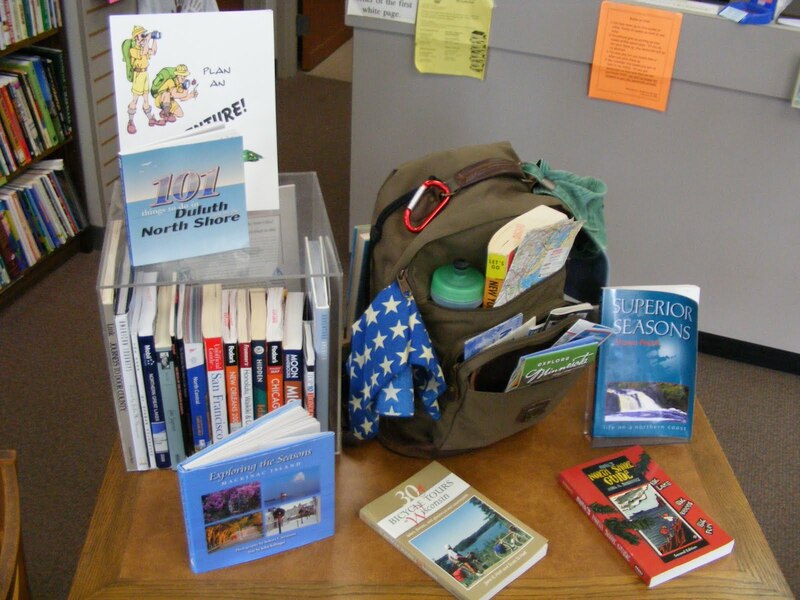 If you spend $15 or more, you will receive a free library canvas tote. Join us and find quality books at affordable prices! July 12 is the birthday of the man who said, “I went to the woods because I wished to live deliberately, to front only the essential facts of life, and see if I could not learn what it had to teach, and not, when I came to die, discover that I had not lived.” That’s Henry David Thoreau, born David Henry Thoreau in Concord, Massachusetts (1817). In 1854, he published Walden, or Life in the Woods, which has become a beloved classic. He grew up exploring the woods and fields of Massachusetts, encouraged by his mother to learn as much as he could from nature. He went to Harvard, but he didn’t like it very much – he refused a diploma since it cost five dollars. He worked for a while in his father’s pencil factory, and as a public school teacher, and he became close friends with Ralph Waldo Emerson. In 1841, the Emersons invited Thoreau to live with them and work as a handyman and gardener, and he helped take care of their children, taking them on nature walks and telling them stories. Thoreau stayed with the Emersons for two years, and during that time he worked on his writing, and through Emerson, became friends with many of the Transcendentalists. In 1842, Nathaniel Hawthorne and his wife rented some property from Emerson and moved to the area. When he first met Thoreau in 1842, Nathaniel Hawthorne wrote in his journal: “Mr. Thoreau dined with us yesterday. He is a singular character – a young man with much of wild original nature still remaining in him; and so far as he is sophisticated, it is in a way and method of his own. 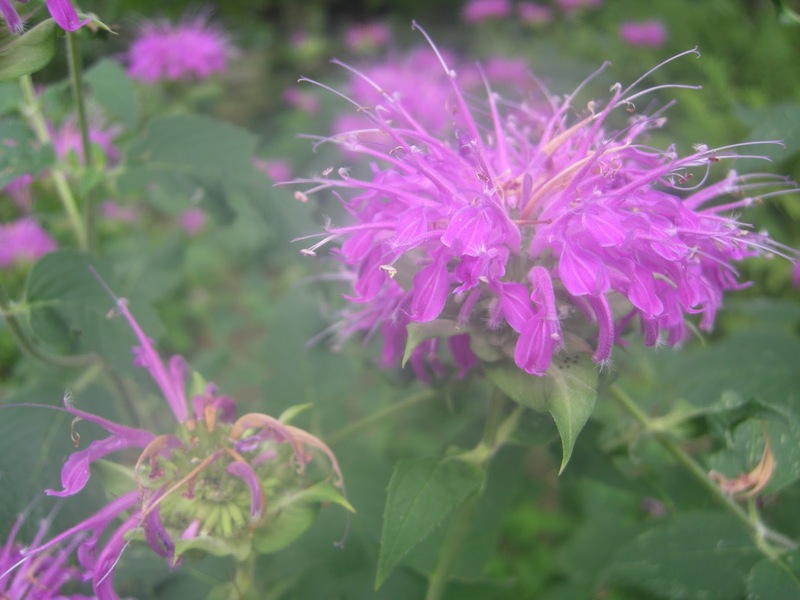 He is as ugly as sin, long-nosed, queer-mouthed, and with uncouth and rustic, though courteous manners, corresponding very well with such an exterior.” The two became good friends, and Thoreau planted a garden for the Hawthornes and did maintenance work for Ellery Channing and his wife. In 1844, Emerson bought land on the shore of Walden Pond, a pristine, 61-acre pond, surrounded by woods. Emerson agreed to let his friend build a cabin there. People assume that Thoreau went out into the wilderness to write his famous treatise on nature, but in fact, he was living less than two miles from the village of Concord. He had regular dinners with friends, continued to do odd jobs for the Emersons, and had frequent visitors. The book he was so committed to writing at Walden Pond was called A Week on the Concord and Merrimack Rivers, about a trip he had taken with his brother. He published it himself, but it sold fewer than 300 copies. During the two years he was at Walden Pond, Thoreau kept a journal, which he published as Walden, or Life in the Woods, (1854). It has become a beloved classic and Thoreau became one of the first nature / wilderness appreciation authors. John Muir and Gene Stratton Porter carried on this tradition. The Thoreau Society was founded in 1941, making it the oldest society devoted to an American author. It’s also the largest. Every July, there is a four-day gathering at Walden Pond to celebrate Thoreau’s birthday. Coldstone Creamery has very generously donated icecream for our Cool Reads for Hot Days programme at the Plummer House. Join us on Tuesday August 9th from 11 am to 1.30 pm. We will have ice cream, cake, ice tea and rootbeer to melt away the dog days of summer. There will be some wonderful silent auction items (literary pocket books, literary stationary and notepads) with book bucket raffles which will even be paired with library wine! 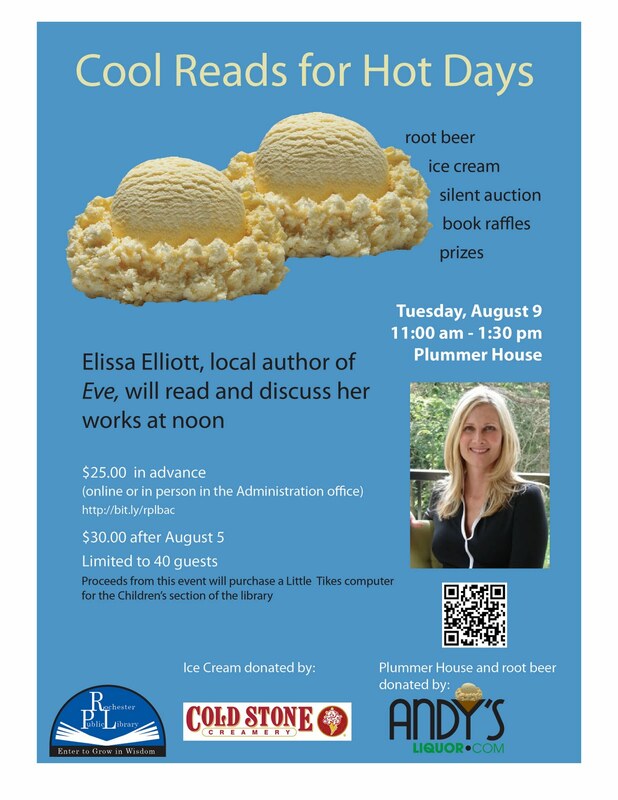 Elissa Elliott will also give a delightful talk on her writing, including the novel Eve. Remember that the proceeds of this event will help support the Rochester Public Library – this time we hope to raise funds to purchase a much needed upgrade for the Children’s computers. We will have another second Saturday Sale in the Friends Bookstore on July 9th! 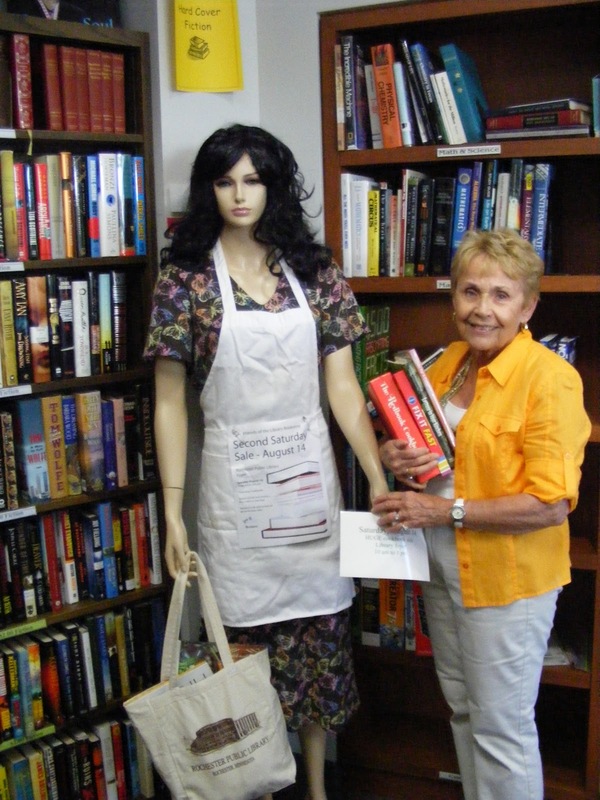 Join Paige Turner in our FOOD FOR THOUGHT cook book sale. Buy $20.00 worth of books and get a free Friends’ t-shirt (while supplies last)! David McCullough has a new book: The Greater Journey: Americans in Paris !!! This is always exciting news for me as I love his work which results from painstaking, detailed, fascinating research. This time he is taking us to Paris, between 1830 to 1900 when so many American artists, politicians, writers, doctors, architects, painters, scientists and others went to centers of excellence to advance their skills, learning, friendships and experiences as well as to escape restrictions at home. It was an exhilarating time brought for by many first hand accounts: letters, journals, diaries some for the first time, are explored by McCullough and provide illuminating intimacies into the turbulent times. There are so many characters here that I love: Emerson, Hawthorne, Twain, Henry James, James Fenimore Cooper, Samuel F B Morse, Elizabeth Blackwell, Harriet Beecher Stowe, Mary Cassett, Singer Sargent. And then there are others that we should know much more of: Charles Sumner, George Healey, Elihu Washburne. The epilogue is particular poignant, although you always have the feeling that it is “enough just being in Paris” – for all the succeeding Americans, including myself (only as tourist!). The illustrations are excellent and pertinent. The index, bilbiolgraphy and source listing are wonderful for continued reading. He wanted to be a painter. But when he got to Yale in the 1950s, John O’Hara, John Hersey, Brendan Gill, and Thornton Wilder were there on campus, and he decided to major in English instead. Professor Wilder became his mentor and inspired McCullough to become a writer. Wilder told McCullough how he chose a subject for his plays or novels: He would find something he wanted to learn more about, go out and see what was written about it, and if there wasn’t much or it wasn’t good, he would write it himself. He worked in journalism for a decade: as a reporter for Sports Illustrated, then for the United States Information Agency, and then for American Heritage. He was doing research for an article at the Library of Congress when he found some photographs of the flood in Johnstown, Pennsylvania, in 1889. McCullough had grown up in Pennsylvania, and he had heard of the flood, but he didn’t realize how serious it had been. He wanted to read more about it, so he checked out some books, but they were all really boring. Then he remembered Thornton Wilder’s advice, and he decided to try writing about it himself. He worked all day at American Heritage, came home and had dinner and put his kids to bed, and then researched and wrote at night. Three years later, he published The Johnstown Flood (1968), and its success meant that he could write full time. He wrote The Great Bridge and then The Path Between the Seas (1977), on the Panama Canal, which President Jimmy Carter used as a key reference book in negotiating the Panama Canal treaties. McCullough is well known for his three biographies about U.S. presidents. The first, about Teddy Roosevelt called Mornings on Horseback (1981) won the National Book Award. The second, on Harry Truman, took him 10 years to research and write. Truman (1993) won the Pulitzer Prize. The third presidential biography he wrote was about John Adams. There were no interviews or photographs around to help him with his research, but he read all of Adams’ diaries and over 1000 letters between John Adams and his wife, Abigail. McCullough wanted to get inside the head of John Adams, including reading what Adams read for pleasure in the 18th century. He read classics by Swift, Defoe, Samuel Johnson, Smollett and Pope. He said reading these books allowed him to “marinate” his head in John Adams’ thoughts and vocabulary. When John Adams was published in 2001, it became one of the fastest-selling nonfiction books in history. McCullough won another Pulitzer Prize for it. He has won numerous honors and awards, including the Presidential Medal of Freedom, our nation’s highest civilian award.